The Walking Dead S9.14 review: "One of those rare episodes that we’ll be talking about years from now"
Perhaps what makes Scars so shocking is that we had very little inclination, aside from a few vague teases, that it was even coming. The episode does feel like an abrupt interruption of the ongoing Whisperer war (though I’m happy to get a brief respite from Alpha's theatrics before the finale), but makes so much sense in the context of this season’s wider themes, going back in time to finally reveal the dark truth behind Michonne’s out-of-character isolationism in the present day. Unlike those deployed in episode 10, Omega, Scars’ use of flashbacks feel organic, bringing actual value in explaining character motivations and enriching its own thematic texture, switching between past and present at smart intervals to emphasise the narrative parallels of the two timelines. The sedate, melancholic opening, in which we see Daryl (Norman Reedus) and an expecting Michonne (Danai Gurira) still searching for Rick a few months after his "death", almost lulls us into a false sense of security, and the gradual escalation to the unexpected climax is near perfectly paced. "The darkest the show's been since Carol told Lizzie to look at the flowers." The present timeline has the same effect, in which so little happens that you’re briefly left to expect just another run-of-the-mill Walking Dead chapter of nonchalance. Daryl and his new gang arrive at Alexandria, they leave, Judith goes to find them and gets in trouble, and Michonne comes to her rescue. At the surface, it's not that interesting. Instead, Scars succeeds as a character study that decides to run a gauntlet against the toughest survivor in the show, and testing the lengths Michonne will go to protect her children (this is a recurring theme in season 9, in case you haven’t noticed). We’ve known that both Michonne and Daryl have received mysterious scars from someone since the time jump in episode 5, but the reveal that they were branded by a pack of feral children under the manipulation of Jocelyn (Rutina Wesley) - an old college friend of the former’s - comes as a curveball shocker, rendering the torture scene itself all the more painful to watch. But that’s just the beginning of the titular Scars burned into Michonne’s psyche by this event. What follows is even worse. As Michonne is forced to choose between saving Judith and sparing the lives of the children about to kill her… well, you know the rest. The moment itself is shot exceptionally well, abstaining from showing any actual infanticide, but never willing to reduce its impact, cutting to present day Michonne hacking up Walkers in anguish whenever her blade meets another child attacker in the past. It should go without saying that Danai Gurira’s performance here, and indeed throughout the episode, is nothing short of award-worthy, beautifully transitioning between stunted grief, parental anguish, and raw pain to the dictates of each scene. 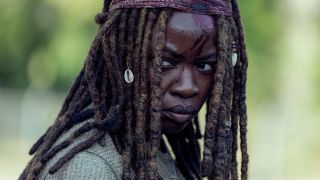 If this really is the actor’s last full season before she departs, Gurira's firmly earned her place in Walking Dead history, and can leave with her head high (not something that every TWD alumnus can brag about). Scars is one of those Walking Dead episodes that comes in a blue moon, suddenly and unexpectedly reminding us that the show is still capable of powerfully evoking the human trauma that personifies the apocalypse. More than that, the chapter takes several of the ongoing problems I had with this season (Michonne’s character arc, misused flashbacks) and spins them into an unmissable Walking Dead fable. This is one of those rare episodes that we’ll be talking about years from now as a highlight of the series, and I can only hope and pray that AMC has even more of them in store as we look towards The Walking Dead season 10. Verdict: Scars is a harrowing, tragic, and near nauseating chapter of The Walking Dead. It’s also one of the most poignant episodes the show has produced to date.